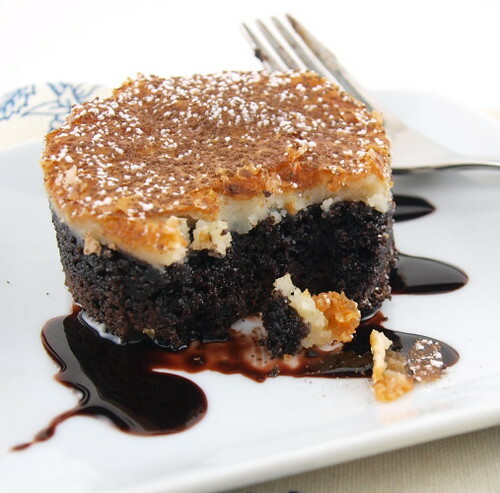 If you grew up in the Southern part of the United States then you are probably familiar with gooey butter cake. You might also know it from Paula Deen on The Food Network who has made a cottage industry out of the dish, going so far as to sell countless varieties of them on QVC. 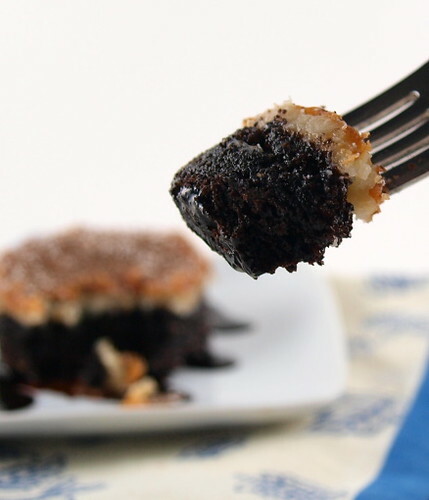 Growing up we never had gooey butter cake. My first experience with it was about ten years ago and I was hooked. The only thing I did not like was the cake mix base. 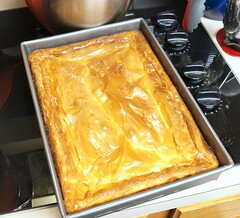 I think you know what I am going to say next … I decided to make a gooey butter cake from scratch! 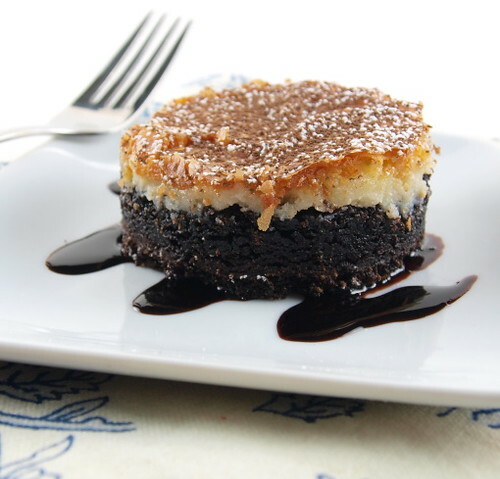 Since this is for the Top Chef Just Desserts Elimination Challenge … Challenge, and the challenge last week was a black and white dessert, I decided to make a black and white gooey butter cake. I went with a dark chocolate base, made with Dutch-processed cocoa for an extra dark color, and a white chocolate topping. 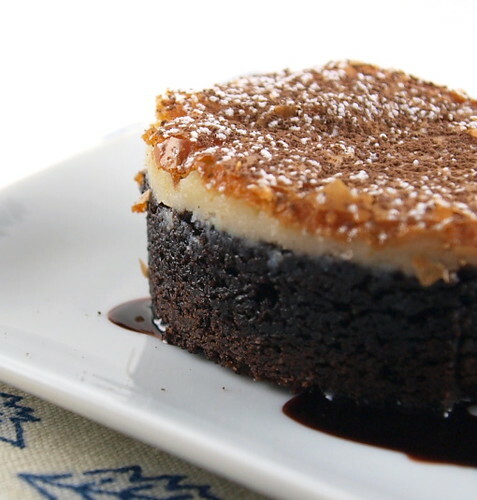 This is a very rich dessert, so a little really goes a long way. It is best to let these chill thoroughly before cutting, but let these warm up to room temperature before serving so you get the full impact of the flavors. 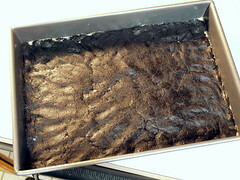 Heat the oven to 350 F and spray a 9″x13″ (quarter sheet) pan with non-stick cooking spray. 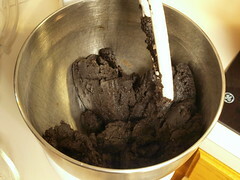 Begin by preparing the base. 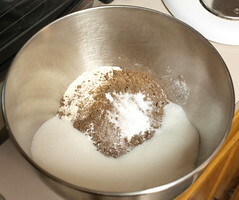 In the bowl of a mixer combine the flour, cocoa, baking power, baking soda, salt, and sugar until well mixed. 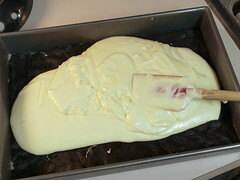 Add the melted butter, both eggs, and vanilla and mix until a stiff dough forms. 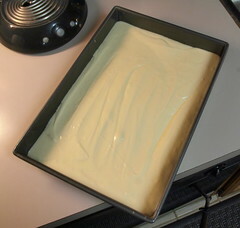 Turn the dough out into the prepared pan and press it so it covers the pan evenly. Set aside. 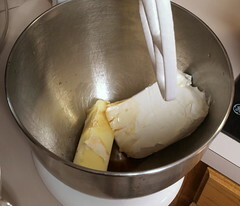 In a medium bowl cream together the butter and cream cheese until smooth and evenly mixed. Add the eggs, one at a time, mixing well after each. 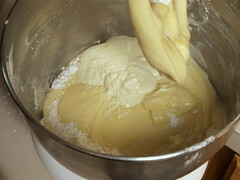 Next add the vanilla, powdered sugar and melted white chocolate and mix until thoroughly combined. Pour the topping over the base and spread it so it is even. Bake for 35 to 45 minutes, or until the top is browned and the center is just slightly jiggly. Cool at room temperature for one hour then chill in the refrigerator until very cold, at least 2 hours or overnight. Cut the cake into desired number of pieces and dust with powdered sugar just before serving. Time for the Elimination Challenge … Challenge Round-Up! Lynne at The Twisted Chef made a sinful looking Semi Sweet Chocolate Star Anise Crème Brûlée. Yeah, there is no white yet, but I would still eat it … oh yes! !